Kerala has two rainy seasons, the first Kerala rainy season starts in June and the second in mid of October. Unlike some other places, the monsoons in Kerala do not take the form of incessant rain over days and weeks that stop all activity. It rains for a few hours and with sunny interludes. These golden interludes provide a balance of the natural flow of life. Here Quick Kerala Holidays providing you with the best Kerala monsoon tour packages. Quick Kerala Holidays has launched a perfect holiday package ”Kerala Monsoon Special Package” covering Munnar, Thekkady(Periyar), Alleppey Houseboat, Kovalam and Kanyakumari. Monsoon in Kerala brings out the best possible outcomes in Kerala Ayurveda and hence, it is considered as an ideal for Ayurvedic treatment and also help to explore the beauty of rains in Kerala. Book Kerala Monsoon Tour package to experience the enchanting beauty of Kerala monsoon tourism. When nature returns to the rain, it is time for man to rejuvenate. According to Ayurveda, Monsoon is the best season for human beings for rejuvenation therapies. All meals and snacks in the houseboat. Well maintained vehicle with well mannered driver. Any expenses of personal nature such as drinks, laundry, telephone calls, insurance, camera fees, excess baggage, emergency/medical expenses etc. Normally Hotel/resort Check in 12:00 hrs – check out is 11:00 hrs. Due to low temperature at Munnar & Thekkady, A/c rooms are not providing. If you require AC, you can pay extra directly at hotels and upgrade, but depends on the availability. Some sightseeing spot have weekly holidays, we won’t be able to compensate if travel date falls in this day. The rate is calculated on the basis of hotels and room type mentioned. Any customization on Meal plan, Hotel or Room category will increase or decrease the package cost. If you have taken an extra bed, please note that only mattress will be provided and not coat, though few hotels provide. Day 01: Cochin – Munnar. Upon arrival our representative will meet and assist you to transfer to Munnar. Munnar is a land of Misty Mountains and spectacular tea plantations. The best hill station of Kerala. Watch the spectacular beauty of Tea Gardens; enjoy the nature, where the cloud turns into mist, which may touch you with a romantic feeling. Sprawling tea plantations, picture book towns, winding lanes and holiday facilities make this is a popular and most wanted tourist place of Kerala. On the way, you have the opportunity to enjoy the scenic beauty of Cheyyappara waterfalls, Valara waterfalls, Cardomn Plantations, Tea plantations and Visit to spice Garden(at own cost, coordinate with driver). Hence your trip may extend as per your wish till check in to hotel. After check in to hotel and take rest. Later you can visit Blossom Park, Pothenmedu View point, and Tea museum (will be closed on all Mondays). At the evening you have the opportunity of shopping at Munnar Town. Following the breakfast proceed for sightseeing, which includes Photo Point, Honey tree, Mattupetty Dam (boating at own cost, coordinate with driver), Echo point (The natural Echo phenomenon is always happening here), Shooting point, kundala lake, the Eravikulam (Rajamalai) National Park (will be closed on February and March in every year) which is a 30 minutes’ drive away from Munnar town (where you can see the rare species of Mountain Goat). Overnight stay at the resort in Munnar. Day 03: Munnar to Thekkady. Following the breakfast proceed to Thekkady (Periyar), land of rainforest, wildlife’s and spices. In the Periyar forest of Thekkady is one of the finest wild life reserves in India, and spread across the entire district are picturesque plantations and hill towns that hold great opportunities for treks and mountain walks. This plantation town is situated on the outskirts of the Periyar Sanctuary. The main attraction at Thekkady is Boating at Periyar Lake (at own cost). You can do other optional activities like, Elephant safari, Kalari payattu (A traditional martial art), Kathakali Show (A traditional performance art), Jungle Jeep Safari, Ayurveda massages etc at Thekkady and these are not included in the package cost. But if you are interested in any of the activities you can coordinate with our driver and he will assist you promptly and with supplementary charges. NOTE: Periyar Wild Life Sanctuary Boat Timings: 07:00; 09:30; 11:30; 14:00; 16:00; hrs. No advance ticket booking for boating at Thekkady; the guest should take tickets directly on arrival. Kindly cross check the boat timings once you reach; since only a few boats are available for cruise at Thekkady. Day 04: Thekkady – Alleppey. Following the breakfast, proceed to Alleppey to board onto the Houseboat at 1200 hrs. Begin the exciting journey of backwater cruise with the comforts of houseboat. Houseboats are the modern forms of kettuvallams or rice boats which were used as ferries to carry rice. Lunch on the houseboat and later cruise through the narrow canals of the Vembanad Lake. 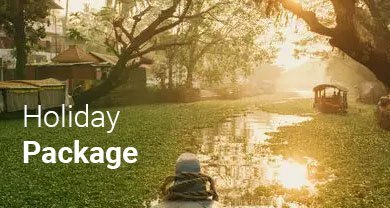 Explore the serene and scenic backwaters passing through lagoons, canals, lakes, rivers and inlets. See the traditional villages and coconut groves from the deck of the boat. Splash water with your hands and enjoy the unique world of water and wonderment. Luxuriant greens, tranquil backwaters, coir-laden houseboats and magical beauty will heal your mind and body as you travel to surreal Kerala backwaters. The boat moors on the lake for the night by evening. After dark you can enjoy a delicious dinner to the sound of water lapping the side of the boat. Terms and conditions for House Boat: (1). Check in time is after 12 noon and check out time is 9 am, (2). A/c will operate from 9 pm to 6 am, (3). House boat will be anchored by 5.30 pm and there will not be any cruise till 7 am in the next day morning due to Govt. restrictions, (4). The house boat will remain idle in the lake at lunch time. Day 05: Alleppey – Kovalam. After check out from the houseboat and proceed to Kovalam. After check in to hotel take some rest proceed for sightseeing like The Palace, The Museum (will be closed on all Mondays), The Zoo (will be closed on all Mondays), The art Gallery etc. After completing the sightseeing then at the evening spent some times at the Kovalam Beach. Overnight stay at the resort in Kovalam. Day 06: Kovalam – Kanyakumari – Kovalam. Day 07: Kovalam – Trivandrum/Cochin drop. After completing the sightseeing proceed to Cochin/Trivandrum airport/Railway station to connect your flight/train to the onward destination, with sweet memories of your holidays and with a promise to return once again to this part of the world. The transportation includes services of an English/Hindi speaking driver along with all applicable govt. taxes, toll, parking, driver allowance and fuel charge.